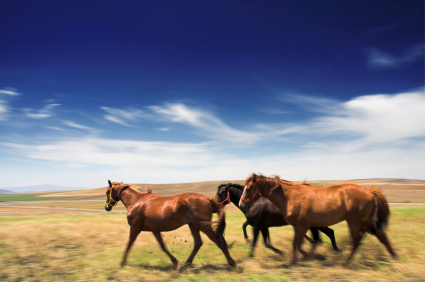 Novato (located in Northern Marin County, California) is one of the few locations within the Bay Area (and within 30 minutes of San Francisco) where equestrians can roam with relative ease. Indeed, if you spend any time hiking or driving through Novato’s Wild Horse Valley, Mt. Burdell open space, Atherton Corridor, or Pleasant Valley, you are highly likely to encounter horses and their riders enjoying the laid back atmosphere. There are also numerous boarding, instructional, and leisurely riding facilities in Novato. There is even a horseman association (Novato Horseman, Inc.) with several hundred members, which engage in trail rides and social events year round. There are numerous horse properties in Novato. They are concentrated in several highly desirable neighborhoods characterized by an overall country feel, including the Atherton Corridor (along Atherton Avenue between HWY’s 101 and 37), Indian Valley, Wild Horse Valley, and on the western side of town. If you would like a list of all available horse properties in Novato, California, or Marin County, please get in touch with Kyle Frazier, Marin Realtor & CRS, at (415) 350-9440. This morning I cleaned out my gutters and cleared out my gardening beds of their Summer plantings–sure signs that Autumn is upon us. And while the summer crop produced in the garden is now long gone, many of the homes that came on the market this Summer remain available and ready to harvest. Although the number of homes on the market in Novato is well down off its high earlier this year–there are currently 186 active listings–there are many excellent values out there. Sellers who have to sell in this market have really come to understand the need for aggressive pricing because of the relatively large number of foreclosures in Novato. These foreclosures can be disastrous to neighborhood values. However, because of their generally poor condition and the stringent terms required by the banks selling the homes, many buyers refuse to engage in pursuit of foreclosed homes for sale (and just about everyone is walking away from short sales). Moreover, because the banks are using pricing schemes to lure buyers into making offers, many of these so-called foreclosure “deals” are selling way above asking price. In fact, one foreclosure in Novato’s Country Club neighborhood sold last month for over 11% above asking price in an all-cash deal. As I have said before and I will say again, present day Novato is the Valhalla of value in Marin. Anecdotal evidence supports me–4 of my Novato listings sold last month alone. Certainly, those who cannot afford a run at the higher priced homes of Southern and Central Marin are flocking to Novato. We are also fielding lots of investor calls. Perhaps people are selling off equities and again plunging into the more bullish realm of Marin real estate? Perhaps people feel we are at bottom? Perhaps the fact that the HWY 101 project is slated to be done soon is easing concerns over the commute to San Francisco? About the same as in October 2008, there are 33 homes currently listed under $500,000 and 51% of these are in escrow (that’s a strong lower end). There are a total of 94 homes under $600,000 currently on the market. At the top end of the spectrum, Novato’s semi-luxury market ($1 million to $1.5 million price range) posted another 4 sales (29 of these homes have sold over the past 5 months). Also, note that 49% of condos on the market in Novato are in escrow (down from 53% last month). Yet, the most surprising market segment is the $600,000 to $750,000 price band with 37% of homes in escrow (up from 27% last month). This price band has been sluggish through much of the year, yet last month and this month we are seeing a lot more action. Thirty-six Novato homes sold in October 2008–down by 10 from September 2008. These homes averaged about 113 days on market, were about 2,254 sq. ft., and sold for an average sales price of $739,000 (roughly $336 per sq. ft.). Homes in Pointe Marin, Country Club, Rush Creek, and Bel Marin Keys seemed to generate the most calls, showings, and sales. Just this morning, Novato’s Old Town was the scene of a minor commotion as the newest piece of street art was being positioned on Grant Avenue. This installation was the latest of a series of artistic benches commissioned by the city to be installed along Grant Avenue. These artsy benches were created by Jeffrey Cooper, a New Hampshire artist. He has enhanced public spaces across the nation with his unique vision. Indeed, a few days ago a trio of grazing horses were set out to pasture on Grant Avenue. The appearance of grazing horses across from Grazie Cafe certainly delighted my children–one of whom happened to be wearing her Halloween cowgirl costume when she first noticed the horses. The art has been funded by fees paid by real estate developers for various projects. The remaining benches should be intalled by the end of November.